Thank you to Elizabeth Luddington, who runs Stockport Sling Library, for our first guest blog post. I didn’t use carriers with my first baby in 2011. When I had my second baby 17 months later, in 2012, I knew I needed something to allow my hands free to run after the toddler! We didn’t have a local sling library when she was born. The first unofficial meet of our sling library-to-be was when my new baby was just under 2 weeks old. I toddled along and met some fellow sling enthusiasts. From that meeting I borrowed a stretchy wrap, and after a few months I tried a woven wrap. 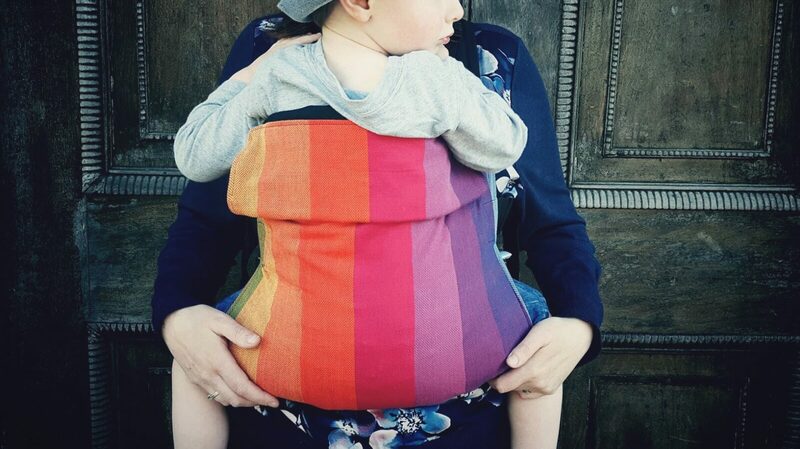 It wasn’t long until I tried my first buckle carrier – a Connecta baby carrier! I loved it from the start. The Connecta carrier gave me the freedom to carry on carrying my baby after I’d started finding the stretchy less supportive. Carry on carrying is just what I did – it’s her 5th birthday today and she still goes up on occasions! 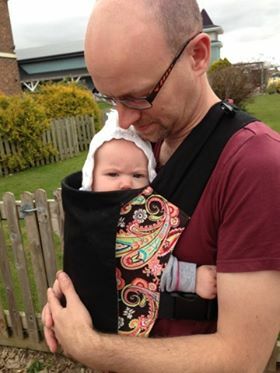 My absolute overriding special memory of that first Connecta baby carrier is a trip to Chester zoo for my birthday when my baby was 4 months old. It was the first time I managed to breastfeed in a sling. The Connecta had already brought me the ability to manage a toddler and a newborn on my own, share outings with them – and now it enabled me to feed on the go too, magical! I own many more Connecta carriers now. I’m quite partial to the Oscha starry night wrap conversion Connecta carriers, but that very first Connecta baby carrier will always have a special place in my heart.